Spectacular contemporary masterpiece completed in 2017. 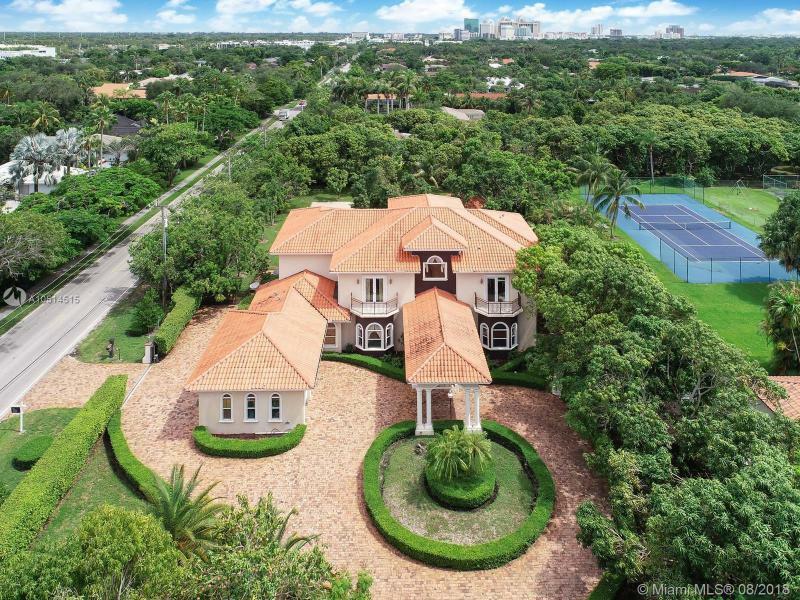 Corner lot completely walled in & gated for privacy in north pinecrest. 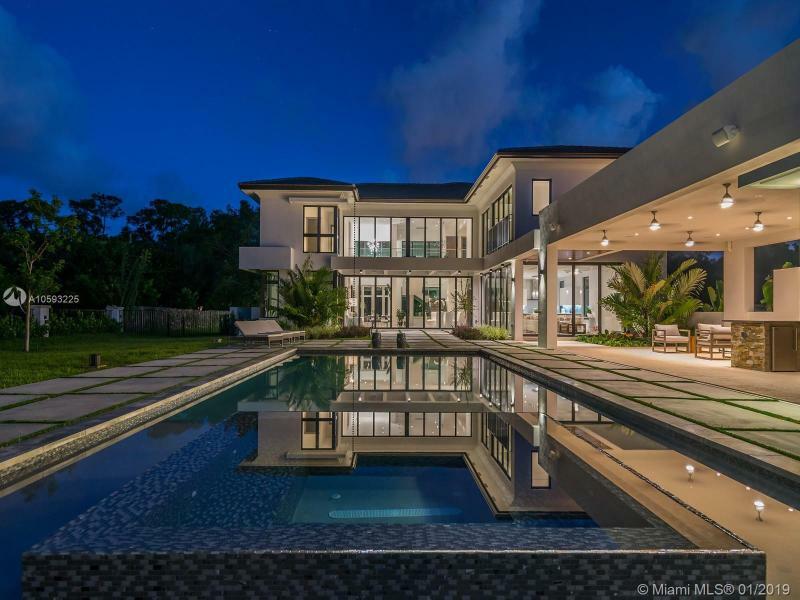 House was meticulously designed w/ superior finishes including soaring ceilings & panoramic walls of glass integrating indoor & outdoor spaces. The foyer entrance will lead you towards the magnificent double height living & dining room overlooking the garden & pool area. Property also features mia cucina italian designed vanities & kitchen cabinetry w/ white quartz countertops, hardwood & marble floors throughout, electric shades, lutron & surround sound systems & elevator. Enjoy resort style outdoor living w/ fully equipped kitchen, heated pool, covered patio, separate gym area w/ full cabana bath surrounded by beautiful landscaping. Perfect for entertainment. Just completed january 2019!! Sophisticated elegance awaits you in the rich masterful architecture of this luxury estate, just completed and ready for new buyers on a quiet pinecrest builder's acre. 5 bedrooms, 6. 5 baths, oversized social areas, 2 large covered patios, an enormous heated pool & spa (20'x40'), & a side entry 3-car finished garage. The sumptuous interior will delight at every turn: 12'+ ceilings, italian & spanish porcelain flooring, led recessed lighting, pre-wired for smart home technology, & a luxurious kitchen with cabinets from veneta cucine, subzero and wolfe appliances. Quality finishes abound! This is not your typical home! Cote dor is a classic estate-sized home backing to the newly renovated riviera golf course! Expanded in theearly 2000s, it features a sprawling floor plan with views of the golf course from many rooms of the home. The north wing of the residence includes the garage plus 2 bedrooms and 2 baths (one best used as an officeor service quarters) while the south wing features the large master suite + sitting room and 2 additionalbedrooms and hall bath. It is sensory overload while relaxing in the family room with the golf course as thebackdrop. Cote dor also enjoys a sun-drenched pool and patio that is ideal for entertaining and al frescodining. Walled and gated for privacy, the estate offers immense curb appeal that is a pre-requisite for a streetof this caliber. Your eyes are not failing! The price is right and absolutely mind-boggling. Live like a royal in this 2006mediterranean-inspired estate. Elegant and opulent, this 7-bedroom, 6. 5-bathroom residence sits on more thanan acre of land (54,000+ square feet) and is perfect if you are looking for: marble floors throughout; a well designed eat-in (island and nook) gourmet kitchen with lots of counter space and cabinets galore; vaultedceilings that feel sky-high; a grand staircase that will be the perfect backdrop for all your future portraits; anenormous master bedroom with closets aplenty and a master bathroom befitting of any king or queen. Besides its lush, tropical greenery, the outdoor area offers a pool, a barbeque area and half basketball court. Priced for an immediate sale. Quintessential 4 bedroom 4 1/2 bath colonial estate nestled on coveted triple lot on prestigious alhambra circle. Spacious living areas provide for a gracious lifestyle & entertaining. This home features formal living & dining rooms, paired fireplaces, home office, 1st floor staff room. The kitchen, designed with a gourmet chef in mind boasts viking appliances, a generously proportioned center island, butlers pantry, wine cellar, eat in & entertainment areas. The second floor is comprised of an intimate master bedroom & 2 addtl bedrooms & en-suite baths. Impact windows & doors, heated pool, lutron lighting exterior cameras, electronic perimeter fence and just a 3 min drive to world renowned biltmore hotel and championship golf course. This is the perfect home in the city beautiful! 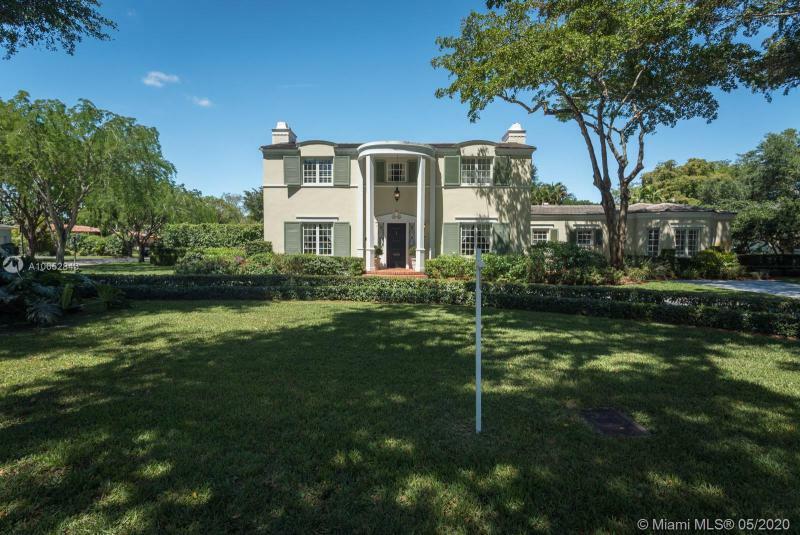 Coral rock gem in exclusive north grove crafted in 1915 by george pfeiffer, pioneer miami architect from germany. His vision created this masterpiece using natural materials of dade county - pine, oak, and quarried keystone(coral rock). The house sits high on a coral bluff across the street from biscayne bay but not in a flood zone! !this timeless classic which incorporates melodic japanese influenced roof lines in its design features coffered ceilings and two fireplaces!! - one in the living room and one in the master bedroom. From the lr you are visually drawn to the back yard with its majestic 100 year oaks as well as other native trees including gumbo limbo trees native to the grove. A unique must see property.